SHHH…. SILENCING STORY GETS BIGGER! 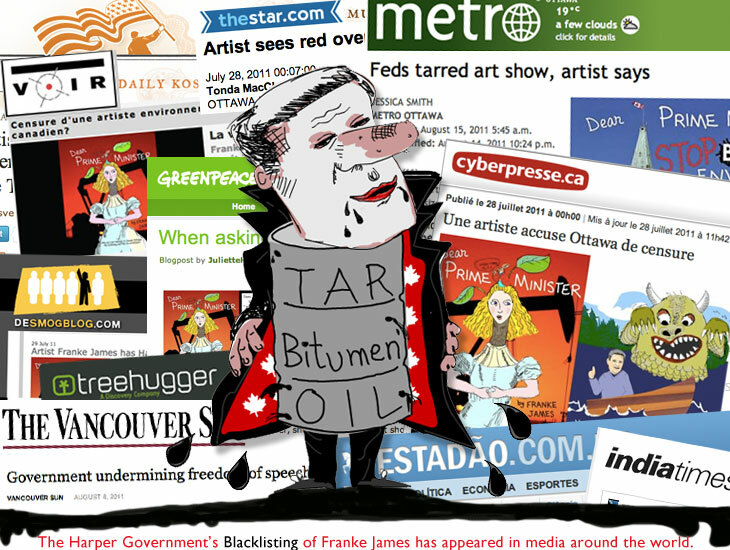 More than 20 articles have appeared in major media, blogs and environmental websites since news of my blacklisting broke on July 25th. See some of the news articles. Franke… the phone is for you — Ottawa is calling…. Why did the Canadian Government bully and intimidate an NGO? What right does the government have to warn an NGO not to exhibit my art? 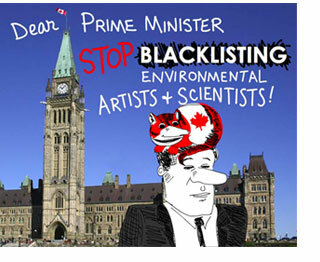 The Government’s bullying and blacklisting is on public record now on the NGO’s website and in the Toronto Star. Warning an NGO not to exhibit my art is blacklisting! But the phone call wasn’t from a Canadian Official… It was reporter Jessica Smith from MetroNews in Ottawa, who heard about my plight on Twitter. She called to interview me about my crowdfunded billboard coming to the Nation’s capital. See her story “Feds tarred art show, artist says“. Which led to CJAD radio in Montreal calling…. “What’s this about you being blacklisted and launching a billboard campaign?” So, on Saturday I’m being interviewed by Anne Lagacé Dowson. Anne is a former CBC Radio host with an impressive cultural and political bio. Annoy the Heck out of Harper! Help fund my billboard in Ottawa! Sixty-one people have pledged $3,202! We are within $798 of being fully funded!! Wow! But the clock is ticking… we only have two weeks left to raise the remaining $798. Please consider throwing $20 in the pot. It’s a great way to annoy the heck out of Harper — and stand up for free speech. The Writers’ Union of Canada Has My Back! The Writers’ Union doesn’t like writer’s getting muzzled. It has echoes of book burning, Orwellian Thought Police, and lots of nasty implications for a so-called democratic country like Canada. Greg Hollingshead, Chair of The Writers’ Union of Canada, sent a letter to the Minister of Foreign Affairs, John Baird (who is in charge of Canada’s Embassies around the world, and also knows all about the environment as he used to be Minister of the Environment, coincidentally at the same time my now contentious Dear Prime Minister visual essay was published). 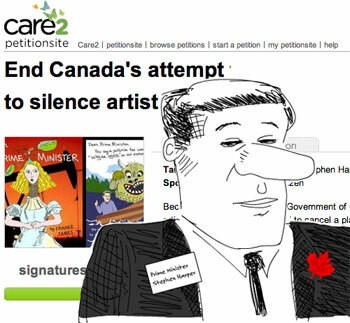 Have you signed the CARE2 Petition? 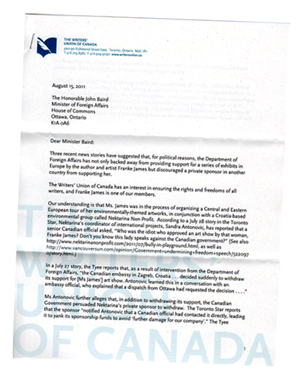 “Because of pressure from the Government of Canada, artist Franke James was forced to cancel a planned tour of Europe. This not the first time the Harper Government has silenced those who blow the whistle on the country’s shocking environmental record. Thanks to everyone for your help in spreading the word and raising awareness about this dirty oil/dirty politics blacklisting by my own government. Many of the people who have been “muzzled” are scientists who work in some way for the government. In my case, I am not “owned” by the Harper Government and am determined to use my creative voice to speak out. August 2nd: Silenced in Europe, Franke Gets Loud in Ottawa! What a tremendous whirl this has been and how fascinating to see you recap all that has occurred so far. The so called silencing really appears to have trengthened your voice. I wonder if you will ever get answers to your questions?